A new differential pressure transmitter from Alvi Technologies is helping operators at process plants improve the performance of filters used to remove unwanted particles or contaminants from gas or liquid process media. Process plants can face pressure drops when the filter gets clogged or contaminated. The operator can then arrange for the filter to be serviced by measuring this pressure drop. Ideally, a filter should be serviced, repaired or removed only when it’s in an unhealthy state, else it leads to loss of time, manpower and money. If left for too long without servicing, process efficiency will be compromised. Scheduled maintenance of filters cannot be relied upon as it often results in loss of filter efficiency. Only continuous monitoring of a filter’s condition can provide a clear indication of the situation. Alvi’s DE39 differential pressure transmitter ensures quick ROI for the facility by greatly reducing operator error, improving process efficiency and minimising the maintenance requirement. The DE39 measures the differential pressure and displays the reading on a 4-digit colour change LCD with a standard analogue output. The second output signal (channel 2) is proportional to the pressure and can be assigned optionally to the signal P+ or P-. The individual pressures (P+, P-) can also be displayed with switchable pressure units (bar, mbar, Pa, kPa, MPa, psi, InWc, mmW, mmHg). It also provides two independent switching points with various configuration options. 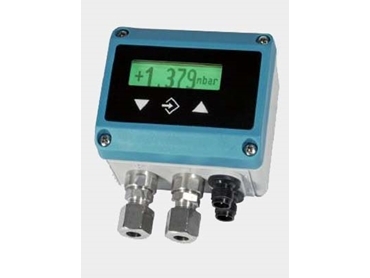 Alvi’s DE39 is also used for differential pressure measurements in applications involving heavily soiled media, simple pump control systems, and pump and compressor monitoring among others.